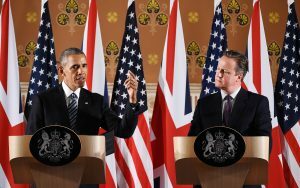 WASHINGTON — President Barack Obama on Friday said the European Union and the United Kingdom will remained “indispensable partners” to the U.S., as he tried to reassure Britons that the storied special relationship between Washington and London can withstand an impending and possibly messy divorce from Europe. “The United Kingdom and the European Union will remain indispensable partners of the United States even as they begin negotiating their ongoing relationship to ensure continued stability, security, and prosperity for Europe, Great Britain and Northern Ireland, and the world,” he said. Obama’s message was viewed by some as unwelcome interference in domestic affairs, and appeared to have little impact. Obama’s comments came in a written statement issued by the White House while the president was traveling in California.